I miss her more than I could ever express. Happy Birthday Maddie. You are beautiful. Happy Birthday Maddie. You will ALWAYS be missed & loved beautiful girl!! 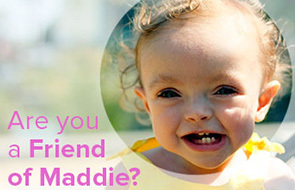 Happy Birthday, sweet angel Maddie. Happy Birthday beautiful, precious Maddie……………………….. Happy Birthday Maddie! I know where James gets the get smile! Every time I see James, I think of Maddie. What a lovely reminder of your amazing little girl. Happy Birthday, sweet Maddie. Beautiful! Just beautiful! Never stop doing posts of Maddie! Happy birthday maddie! I know your celebrating with cream puffs. Oh Maddie Moo, Happy Birthday! Happy Birthday (a little late) to beautiful Maddie! Happy Birthday to Miss Maddie!